This tutorial guides you through the process of setting up security for Time-Off requests and the process of approving Time-Off requests. Each employee can be assigned to a Home Department and then a manager can be assigned to approve the Time-Off requests for the employees in that department. To set up Home Departments, see the Control Table Information page. 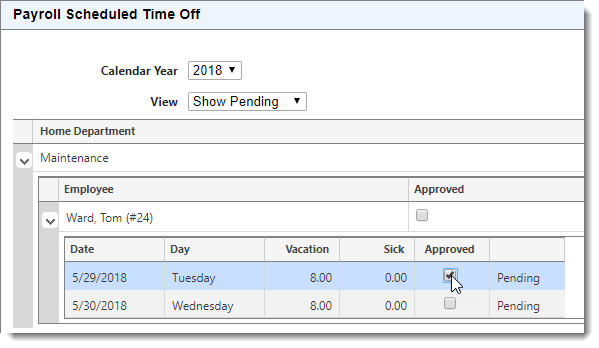 The security options for managing Time-Off requests are grouped by Home Department and maintained on the Employee Information page. An employee (such as a supervisor or manager) can be assigned rights to approve time-off requests for one or more Home Departments. The following steps walk you through this process. 2. Click the Edit icon next to an employee. 3. 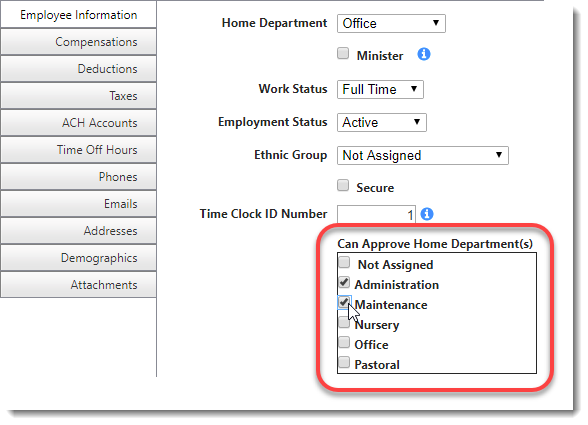 The security options for managing Time-Off requests are grouped by Home Department under the Can Approve Home Department(s) header on the Employer Information tab. 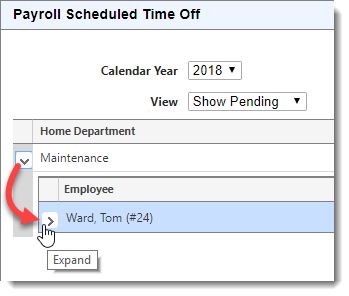 Assign rights for this employee to approve time-off requests by checking the check box next to the corresponding Home Department(s). NOTE: Employees are assigned to a Home Department on the Employee Information page using the Home Department drop-down. 4. Click the Update button when you are finished. 5. Repeat this process to assign rights to other employees, as appropriate. After an employee has submitted time-off days (through the Portal or an HR person has added time-off days to an employee's record), these days need to be approved before they can be processed on a Payroll run. The following steps walk you through the process of approving Time-Off requests from the Dashboard and on the Employee Information page. 1. 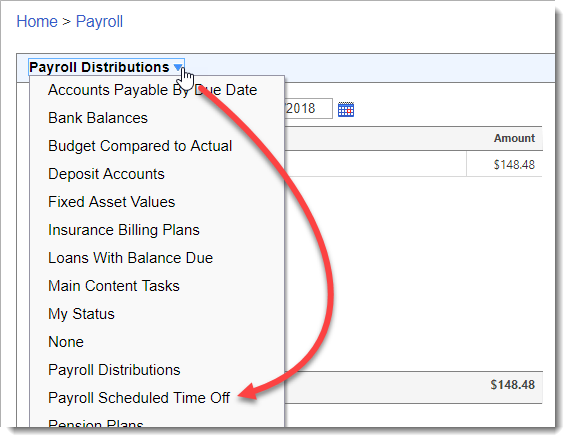 From the Payroll dashboard, select the Payroll Scheduled Time Off option from the widget pull-down menu. 2. Select the current year on the Calendar Year drop-down and then select "Show Pending" on the View drop-down. 3. 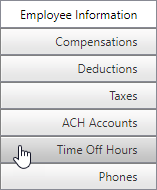 Next, click the Expand icon next to a Home Department and then click the Expand icon next to an Employee. 4. Click the check boxes in the Approved column for the days you want to approve. 5. Continue to approve other employee Time-Off requests as appropriate and then just navigate to any page when you are finished. 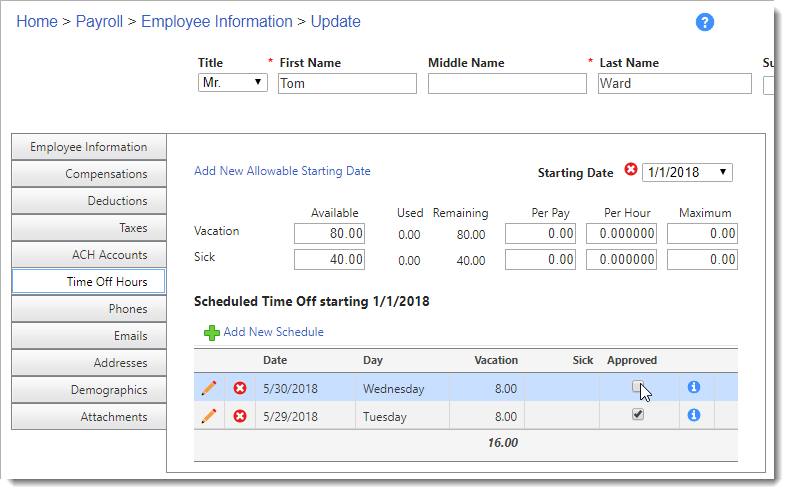 The approved days automatically update on the employees record (Employee Information page). 3. Select the Time Off Hours tab. 5. Click the Update button when you are finished.